Live from Kickstarter, it’s the World’s Edge Arena! Psi-punk’s next sourcebook is here and it’s ready to rumble. Our scrappy contender is raising $1,000 to be able to make it to prime time. With enough Fan favor though, the sky’s the limit. The World’s Edge Arena will be on Kickstarter until Thursday, October 8th, 2015 at 11:59 p.m. PST. Come pledge your support so we can get this book into your hands and onto your table. What is World’s Edge Arena? 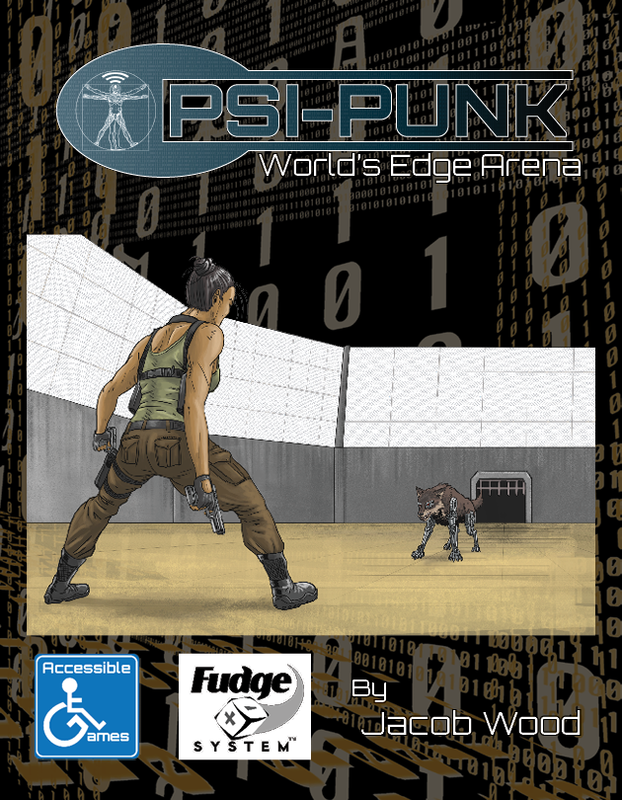 World’s Edge Arena is the second sourcebook for Psi-punk. It takes players to the city of Punta Arenas, Chile, where a televised blood sport known as the World’s Edge Arena takes place. The setting takes inspiration from Fields of Blood and Honor, Mojoverse, Running Man, Thunderdome, and Smash TV. It adds a decidedly Psi-punk twist to the concept of future gladiatorial combat—it’s not everyday you get to watch warriors facing psychicly-controlled, cybernetically-enhanced komodo dragons. Rules for arena combat, including a new Fan Favor mechanic which can help your players turn the tides of combat. A bestiary filled with psychicly controlled, cybernetically enhanced predators such as coyotes with sonic howls and harpy eagles with titanium claws. A close-up look at the city of Punta Arenas in southern Chile, including information about its various districts and local economy. Several new player archetype concepts, such as the Controller, Promoter, Opportunist, and Security Specialist. Six new adventure hooks for GMs to help inspire adventures that go beyond the walls of the Arena. This book is the first official location sourcebook for Psi-punk. It offers a detailed look at the city, its residents, ideas for character archetypes that fit the local flavor, and a great deal of adventure fodder to help GMs run a game set in the area. Download the Chapter 1 Preview PDF. Tagged kickstarter, our games, psi-punk.